COVER. Net curtain is good, because the birds can't see through it. MULCH with straw or woodchips. This keeps the berries clean. PICK every day. They ripen fast! FEED with liquid manure, seaweed or handfuls of compost around the roots. Don't get leaves or fruit wet or they will rot. November is the main planting time for tomatoes, capsicum, basil, chillies, corn, lettuce, beetroot, beans, peas, pumpkins, squash, zuccini, carrots, potatoes, cucumbers and melons. It's a busy time for gardeners! Broad beans are in season now. The biggest pods grow at the bottom of the bush, nearest the ground. Keep them picked and the plant will produce more! 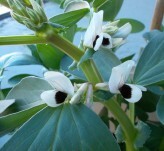 bee pollinating broad bean flowers. No bees-no beans! Shell fresh broad beans or thaw frozen ones. In a food processor, puree one and a half cups of broad beans with one clove of garlic, half a teaspoon of salt, half a teaspoon of cumin, and half a teaspoon of baking powder, two spring onions and a handful each of parsley, and coriander. Stir in four tablespoons of flour and form the falafel mixture into balls and flatten. Refrigerate. Fry the falafels in vegetable oil until brown and crispy on both sides. Serve with tahini dipping sauce. Add a quarter of a cup tahini, half a cup of water, juice of half a lemon, two to three garlic cloves, salt to taste, and one teaspoon of cumin to a food processor. Process until the mixture is smooth. Water new seedlings twice a week for the first two weeks. Give each plant a litre. Before you water - dig the soil and look - is it really dry? Feed your fruit trees in November. Fruit trees are growing their fruit and leaves in early summer and need fertiliser. Give each tree a bucket of compost, or liquid food (made with comfrey or animal manure). Top up the mulch if its a bit thin. Mulching slows down weeds, keeps the soil moist and feeds the soil. If you planted early potatoes like rocket, they will be ready to dig up and try! Later varieties need to be mounded up - push soil up to cover their growing stems - this encourages more potatoes to form underneath.